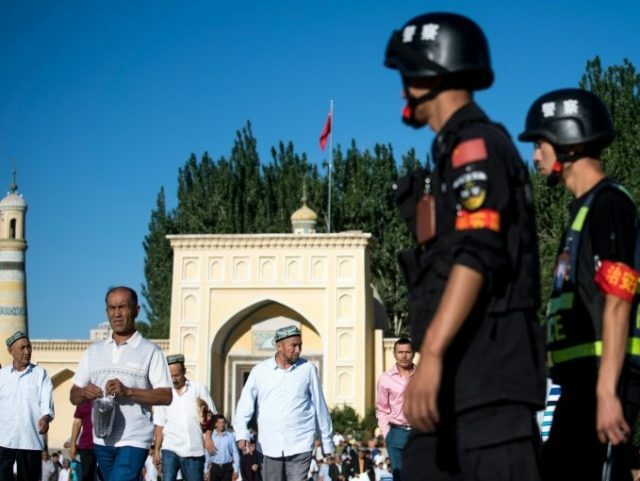 The Chinese Communist Party began building internment camps last year in westernmost Xinjiang province, home to the majority of the nation’s Uighur ethnic minority. Up to two million Uighurs and other Muslim ethnic minorities, such as Kyrgyz and Kazakhs, are believed to have disappeared into these camps. The camps are not prisons – the Chinese regime explicitly does not charge the prisoners therein with crimes – but survivors say they are subject to torture just as body contortion, sleep deprivation, electroshock, and other ill treatment and forced to learn Mandarin and pledge allegiance to Communist Party leader Xi Jinping. Late last year, evidence surfaced that Beijing is using the Xinjiang prisons as slaves and are building factories in the internment camp grounds. Chinese officials insist the camps are “vocational schools” where underprivileged minorities are learning skills that make them more competitive on the job market. This has not explained why so many of those who disappeared are highly educated professionals with stable employment. The Turkish government, in a statement signed by spokesperson Hami Aksoy, condemned China in its statement for worsening treatment of fundamental human rights in the region. “The reintroduction of internment camps in the XXIst century and the policy of systematic assimilation against the Uighur Turks carried out by the authorities of China is a great shame for humanity,” the statement asserts, highlighting in particular news of the death of Abdurehim Heyit, an acclaimed Uighur poet imprisoned not in the internment camps, but in criminal prison for performing a song urging Uighurs to respect their ancestors. The Turkish statement is the first news that Heyit died in prison and China denied the claim, releasing an undated video of a man appearing to be Heyit claiming he is in good health. The Uighurs are a Turkic people and speak a Turkic language; Turkish nationalists regard them as kin and part of the greater Turkic ethnic family. In addition to the official Turkish government statement, Anadolu Agency, the official government news outlet, published a story Sunday highlighting a protest against the imprisonment of Chinese Muslims in New York organized after the Turkish government claimed that Heyit had died in prison. The Global Times, a Chinese government propaganda newspaper, published a scathing opinion piece Monday accusing Turkey of human rights abuses against Turkish Kurds in the nation’s southeast and of allowing its “Pan-Turkism complex” get in the way of intelligent diplomacy. “Turkey has a Pan-Turkism complex and always makes irresponsible remarks on Xinjiang,” it continued, “But since Turkey’s failed coup in 2016, the country’s relations with the West have become estranged. Turkey’s attitude on the Xinjiang question has been more restrained.” This clearly recently changed, much to the dismay of the Times. “Turkey is capricious and shallow on the Xinjiang question and many Chinese people again feel disappointed at Turkey,” the Global Times concluded. The piece also attacked U.S. Senator Marco Rubio (R-FL) for “not really caring” about human rights in an aside acknowledging his vocal support of human rights in communist China. Turkey was once the most vocal supporter of Uighur rights in the world. President Recep Tayyip Erdogan accused China of “genocide” while still prime minister in 2009 over mass killings of Uighurs alleged to be necessary to eradicate jihadists. In the past several years, however, Erdogan has brought Turkey deeper into China’s economic orbit, expressing interest in allowing Belt and Road (BRI) projects in Turkey and attracting more Chinese tourism. BRI is a global infrastructure plan Xi Jinping launched to entice developing countries into giving China control of their major ports, roads, and railways.